If you are over the age of sixty and have had Chicken Pox, you can get Shingles. This disease can strike anyone, but you are more prone to it the older you get. The symptoms of the disease include aches and pains that will feel like you are getting the flu. Another symptom is severe pain, and small blisters or a rash. Before the rash or blisters scab over, Shingles is highly contagious. You can get Shingles more than once. The pain that comes with the disease will normally subside once the rash and blisters have healed, but sometimes the Shingles pain can last for a long time after the outward signs disappear. The complications of Shingles can be severe, even leading up to death. It is important to talk to your doctor as soon as you suspect you have Shingles. Within 72 hours of getting symptoms there are regular medicines available for treatment of the disease. Scientists have discovered that if any of your family members have had Shingles it puts you at a greater risk of getting them yourself. Your Family History plays a large part of determining your risk. The closer the relative is to you on the family tree, the more chance you have of getting Shingles. Doctors have decided that your chances of getting Shingles is more than double that of a person who doesn’t have a Family History of the disease. And if your family history includes a mother, father or sibling with Shingles, your chances are even greater. The risks increase even more if you’ve had several relatives with the disease. Scientific research shows this undeniable evidence of a link between family history and a person’s odds of getting Shingles. The fear and prevalence of smallpox in the Middle Ages led most to assume that chicken pox was the same illness. It was also at times confused with rashes or blisters caused by ergot poisoning or streptococcus virus. In the 1700s, an English physician named William Heberden developed a means of differentiating between smallpox and chicken pox. It was not until almost a century later that physicians determined how to tell chicken pox from streptococcus infections. In 1888, Dr. James von Bokay proposed that chicken pox and shingles were caused by the same virus. In the early 20th century, doctors began to make connections between older patients infected with shingles and younger patients acquiring chicken pox. Finally, in 1953, Thomas Huckle Weller isolated viruses from both illnesses and, upon comparing them, determined they were the same virus. It is now known that the varicella zoster virus, which causes chicken pox, lies dormant in the nerves after a chicken pox outbreak. 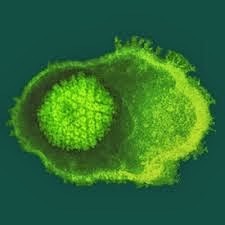 For unknown reasons, the virus sometimes will become active again, causing pain, itching and a rash that typically rises on only one side of the body. Where the rash appears depends upon which nerves have been affected by the virus. 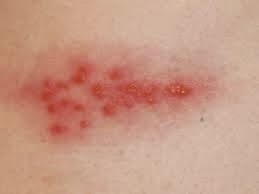 Shingles is not contagious, but it is possible for a person suffering from a shingles outbreak to infect another person with chicken pox, if that person has not previously had chicken pox. During the 1940s and 1950s, various strides were made in understanding the nature and cause of shingles. Chicken pox had been considered a minor illness, but doctors began to realize that it created more serious symptoms and side effects in adults. They also began to compile evidence that shingles was more likely to occur in older people and those with other immune system deficiencies. As more information was gathered, doctors developed more effective ways of diagnosing, treating and even preventing shingles. Recent studies of shingles indicate that if you have relatives who have suffered from shingles, your risk of developing shingles is higher. A vaccine has also been developed that can greatly reduce the possibility of developing shingles if you have had chicken pox in the past. If you have contracted chicken pox in the past, are over the age of 50 and have a relative who has experienced shingles, it is highly recommended that you receive a shingles vaccine to reduce your risk of developing it in the future.